An exciting new product through Rainbird is the TM2 irrigation controller. This product is very exciting and changes everything with its ability to communicate like more advanced commercial controllers. As you can see the layout and look of the controllers are simple for homeowners. Connecting your TM2 to your home internet through the optional Rainbird wifi Module. 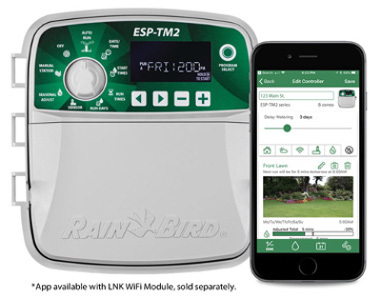 The Rainbird app on your smartphone or tablet provides access to your irrigation system from anywhere in the world . This controller has many features including monitoring the weather in your area by postal code making adjustments accordingly, using the wifi option. This app allows your Apple or Android device to operate as a remote. Like all functions on the app, easily send email invite to contractors or guests, providing access to scheduling, manual watering, programming and watering history. The app notifies you of any important information including faulty valve solenoid, or water duration changes due to weather and more. In short, watering the same each day as the weather changes doesn’t make sense, let the app work for you!! For more information, please call our office.